Your child can easily learn Spanish with the right tools and method. If you’re looking for a “teach baby Spanish DVD”, then we have just what you need. The new MonkiSee video “Todo Sobre Mi” is the perfect place to start your journey in teaching your baby Spanish. Before I tell you more about this Spanish DVD for babies, let’s briefly discuss the importance of learning Spanish. Do you want to teach your child Spanish? Nowadays, it is such an asset to be bilingual. If you can speak multiple languages, you have quite an advantage. The ability to speak more than one language will advance you in school, in your career, in your intellectual understanding, and in many other ways. You never know when the need may arise for you to speak Spanish. Teaching your child Spanish, is a blessing they will enjoy throughout all their life. Whether you want them to communicate with Spanish-speaking family and friends, be prepared for traveling to another country, or are simply developing your child’s skills for future careers, teaching your baby Spanish is one of the greatest gifts you can give them. So, if you want to teach your child Spanish, now is the time to begin. The younger you start the better. That is why we have designed an effective Spanish video for teaching children from the age of three months to three years old. When you hear the benefits of being bilingual and know that Spanish is a dominant language, it is definitely exciting to discover that your baby can easily learn it. 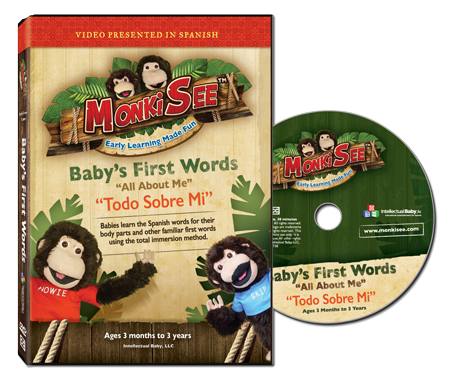 MonkiSee has just released their first “teach baby Spanish DVD,” and we know you’re going to love it! 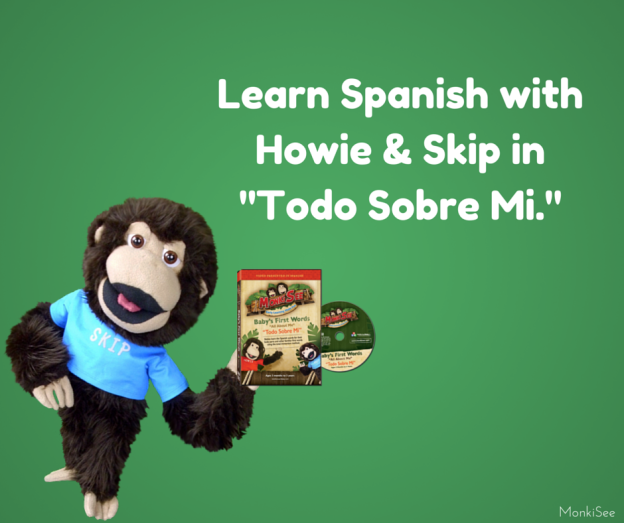 With the new MonkiSee DVD, “Todo Sobre Mi,” your child will begin their introduction into the Spanish language in a fun and delightful way. As the name implies, children will learn – “All About Me.” They will be taught the body parts and familiar first words in Spanish. To most effectively teach your baby Spanish, we use the total immersion method. For a full thirty minutes, your child will hear a native speaker narrating while they watch the actions play out on screen. As with all of the MonkiSee videos, children will learn along with monkey brothers, Howie and Skip. Babies will definitely be entertained as they watch the silly monkeys learning together. MonkiSee makes learning fun by engaging children throughout the videos. “Todo Sobre Mi” is filled with puppet skits, upbeat and original songs, children, animals, poetry, and much more. It’s the perfect way to begin introducing your child to a new language. Whether your children have never heard a word of Spanish, or are being raised in a Spanish-speaking home, “Todo Sobre Mi” is perfect for every child. We hope you’ll join us on this exciting journey in teaching babies Spanish. To find out more about MonkiSee or purchase this video for your child, click here. 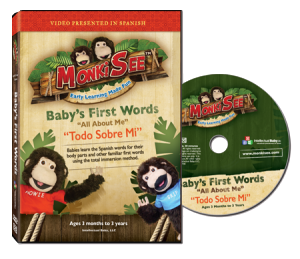 This entry was posted in Educational Videos, How babies learn language, Reviews and tagged MonkiSee DVDs, monkisee review, Spanish on May 15, 2015 by monkiseeblog.